My husband and I have been connecting over many months now to new habits of communicating with each other. We've been married 27 years so some habits of communicating are taking a bit longer to turn toward health! One night recently, at the end of a long discussion that felt as if we were running nowhere at breakneck speed - I hopped into bed. I was feeling weary and thinking we were not experiencing much change. My head hit the pillow and my hand extended out in front of me. Soon, I felt the rustling of the bed covers and the warmth of a hand softly clasping mine. 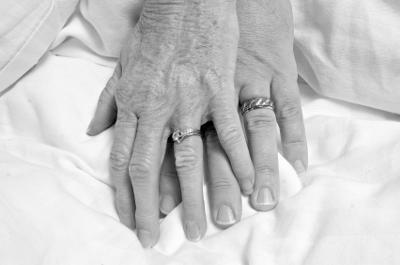 My husband had turned over to face me and gently held my hand. We drifted off to sleep in a moment of sweet accord.